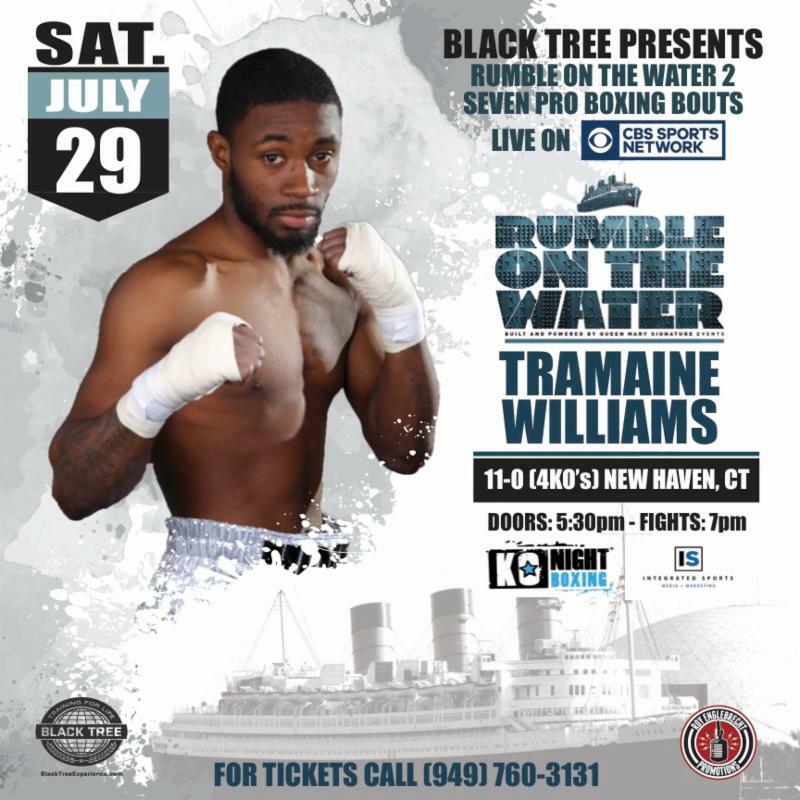 Undefeated featherweight prospect Tramaine “The Mighty Midget” Williams will headline the Rumble on the Water 2″ pro boxing card on July 29, to air (10 p.m. ET / 7 p.m. PT) on CBS Sports Network, live from The Queen Mary’s outdoor venue in Long Beach, California, and Fight Club OC fans can save $10 a ticket with all seats priced at only $60. 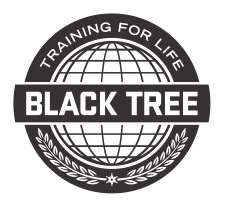 Presented by Black Tree, Rumble on the Water 2 is promoted by Roy Englebrecht Promotions, in association with KO Night Boxing LLC and Roc Nation Sports. 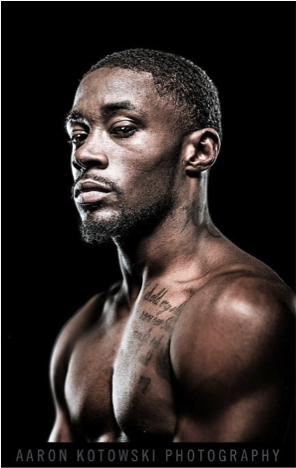 Williams (11-0, 4 KOs) faces Angel “El Gato” Luna (12-3-1, 7 KOs) in the 10-round main event. To order your tickets and save $10 off each $60 seat simply call 949-760-3131. After a sizzling start to his pro career, the New Haven, Conn. native was inactive for nearly two years due to out-of-the-ring issues, but bounced back strong in January 2016, signing a promotional contract with Roc Nation Sports. In his first fight under the Roc Nation Sports banner, Williams dominated Eduardo Garza (6-1) en route to an eight-round unanimous decision on the CBS Sports Network co-featured event in Wichita, Kansas last March. In his last fight on the Andre Ward-Sergey Kovalev II card at Mandalay Bay, Williams produced the most signature victory to date, stopping former NABO, WBC US and California State super featherweight champion Christopher Martin (30-8-3) in the second round. Williams first began boxing at the age of nine, accumulating an impressive record of 97-10 over his amateur career. During that span, he was a ten-time national amateur champion, a two-time Ringside World champion and a four-time Silver Gloves champion. He also was a PAL National Junior Golden Gloves champion. Luna, fighting out of the Dominican Republic, is a proven upset specialist having defeated then unbeaten (15-0-1, 11 KOs) Jose Lopez, on June 6, 2015 at Barclay’s Center in Brooklyn, by way of a six-round unanimous decision. Lopez is currently the reigning WBO International super featherweight champion. Former amateur boxing prodigy, undefeated Brooklyn light heavyweight prospect Junior “The Young God” Younan (12-0, 9 KOs), will face an opponent to be determined in the eight-round co-featured event. Also fighting under the Roc Nation banner, the 21-year-old Younan compiled a sterling 90-5 amateur record, highlighted by his three-time Ringside World and three-time National PAL championship performances. A pair of California heavyweights square off in the in the six-round CBSSN opener as Rodney Hernandez (10-5-2, 2 KOs), of Modesto, meets Los Angeles’ Jonnie Rice (6-2-1, 4 KOs), a former Winthrop College (SC) basketball player. Fighting on the undercard in four-round matches are Los Angeles featherweight Sergio “El Nino” Quiroz (3-0) vs. Lupe Arroyo (2-0), of Huntington Beach (CA), Whittier (CA) lightweight George Acosta (2-0) vs 4-1 Oscar Eduardo Quezada, and pro-debuting welterweights Eric Gomez, of Santa Ana (CA), meeting Long Beach’s Raul Calderon. Remember save $10 off each $60.00 you purchase but you must call 949-760-3131 for this special offer. Doors open at 5:30 p.m. PST with the opening bout scheduled at 6:30 p.m. PST.